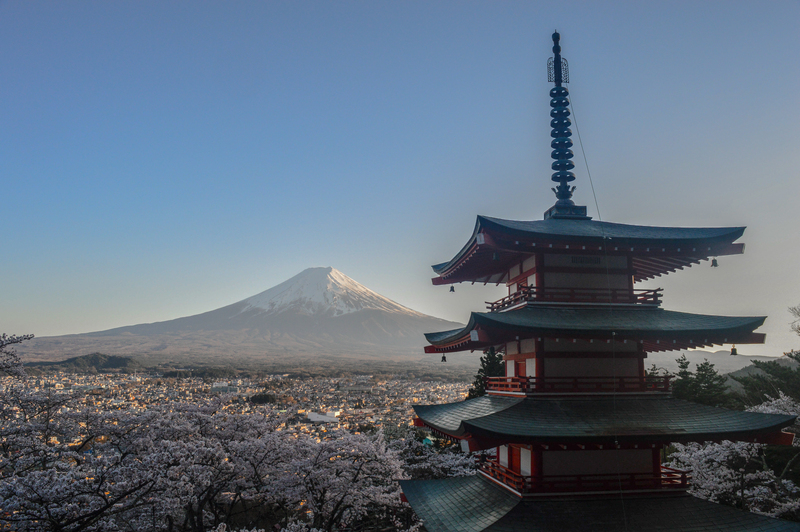 This image is probably one of the most famous and well known images of Japan, sakura flowers, Mount Fuji and a vermillion structure all in one place! What is the Chureito Pagoda? Chureito pagoda is part of Arakura Sengen shrine, sitting on the side of Mount Arakurayama. It was built as a peace memorial in 1963. As with many shrines, temples and buildings in Japan, there are a gruelling 400 steps to reach the pagoda. Most people use the train to visit Chureito pagoda, simply take the Fujikyu Railway line to Shimo-yoshida station. The train starts just after 5am so in the winter months you can get there for sunrise. From Shimo-yoshida station there is a “five minute walk” to the pagoda (remember those 400 stairs). If you have a car there is a small car park around half way up the steps. This car park is not accessible during cherry blossom season, in fact 10 additional car parks are open around the area, including at local schools, to be able to cope with the increased traffic to the area. Parking during sakura season is 1000¥, you are able to return that day with the same ticket if the weather wasn’t co-operating. The busiest time of the year is, unsurprisingly, sakura season. As mentioned above extra car parks are open whilst the sakura matsuri festival is going on. It is hell. Unless you arrive around 6am the photographers area behind the pagoda is absolutely packed. Professional photographers arrive early, set up their tripods and stay there all day. There is very little room to move, I only got shots thanks to being taller and just sticking my camera in the air pressing the shutter button wildly. At other times of the year the area is much calmer and you can take your time setting up the perfect shot. The pagoda also looks stunning in autumn when the sakura tree leaves turn red. You are least likely to get a clear shot in the summer, the winter offers snow topped pagoda roofs. What to do on a cloudy day? Fuji is notoriously shy, some say that the majority of the year Fuji is wreathed in cloud. On my previous visit in 2013 Fuji was in one of those moods, and had constant clouds hiding the peak. As it was summer this was to be expected, but visiting the pagoda was still worth it. To hedge your bets either arrive early at sunrise or come at dusk, these are the times Fuji is most likely to be seen. You can wait it out, which we did in April 2017, this can work during the cooler months. It is still worthwhile even when cloudy, trying to catch Fuji is actually park of the magic of Japans tallest mountain.